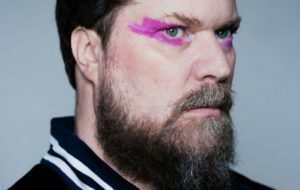 For those familiar with JOHN GRANT’s previous body of work, from ‘Pale Green Ghosts’ onwards there started to be a bipolar nature to his music, swinging from electronic-based tracks being in the minority through to them now being the main focus of his latest work ‘Love is Magic’. The choice of main producer and CREEP SHOW band mate Benge has obviously been a major factor in this synthetic shift. This will either be a welcome move or could leave fans of Grant’s more acoustic-based material wondering what the hell has happened to the man who penned the downtempo AIR-esque songs such as ‘It’s Easier’ and ‘It Doesn’t Matter to Him’… Also rather tellingly, the cover to ‘Love is Magic’ pays homage to FAD GADGET’s ‘Gag’ album with Grant covered in feathers and striking an upwards pose (albeit wearing vintage Y-fronts and with a bird cage on his head). 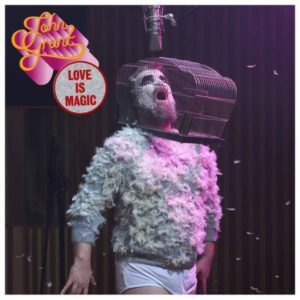 The eponymous ‘Love is Magic’ is a lot more accessible affair, with songwriting harking back to Grant’s earlier work; it’s debatable however whether the synthetic production really does the song proper justice though. The stabbed brass synth, oddly reminiscent of THE POLICE’s ‘Spirits in the Material World’ gives way to a tail-end chorus chord progression straight out of cheese-masters THE CARPENTERS’ songbook. ‘Tempest’ is all triplet delayed synths (which reference KRAFTWERK’s ‘Neon Lights’) and detuned saw bass / pads; the song itself however is pretty forgettable but does feature a rather wonderful outro comprised of 8 bit arcade sounds in a nod to the game featured in the title. ‘Preppy Boy’ takes its cues initially from FAD GADGET’s ‘Love Parasite’, although lyrically we are in SCISSOR SISTERS territory until a trademark Grant synth solo stamps a bit more individuality on the piece. After the Donald Trump-baiting ‘Smug C*nt’, the tempo is raised for ‘He’s Got His Mother’s Hips’. Surely one of the more commercial tracks on ‘Love is Magic’ it features a welcome injection of live bass, funk and classic polysynths. Throughout the album, Grant’s lyrics are wonderfully witty, dark and as sharp as a knife; ‘… Mother’s Hips’ is a perfect example with the brilliant opener “I think Colonel Mustard did it in the billiard room / They say his salsa workshops / Are a harbinger of doom”. ‘Is He Strange’ harks back to Grant’s earlier work (albeit with a minimalistic electronic drum pattern rather than acoustic percussion) and a beautiful descending piano and Solina string synth line straight out of ‘Airport’ by THE MOTORS. 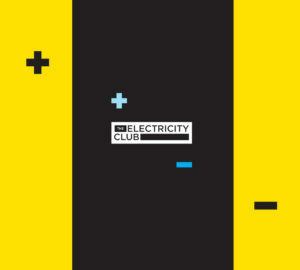 The album ends with ‘Touch & Go’, an evocative mixture of rippling arpeggiators, piano and live drums. If that is the case then his musical metamorphosis is pretty much complete with ‘Love is Magic’; this work is poles apart from ‘The Queen of Denmark’ and could potentially lose him some fans as in the main, it is SO different to the musical aesthetic he started with. There is no pandering to commerciality or laurel-resting here and the willingness to experiment means that ‘Love is Magic’ is not always an easy listen. It is however a brilliant example of an artist who refuses to compromise and has the spirit of adventure to take listeners on an unpredictable musical journey throughout.